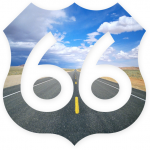 My oldest memory is of Route 66. I was around three years old watching “E.T.” at the Route 66 Drive-In on Watson Road, just outside of St. Louis. The drive-in is long gone, paved over with suburban sprawl, but my love of that old US Highway remains. Years later, I went to visit a friend in L.A. She lived in Pasadena, so we went out to dinner on Pasadena’s main road, Colorado Boulevard. I really liked the street, with all of its stores and restaurants. Only later did I find out that Colorado Boulevard was the last little stretch of the Mother Road, Route 66. A few years after that, My friends and I drove to see Pikes Peak. We had a great time, but it was a long ride. On our way back into Texas, we started getting hungry. Checking with Yelp, we found a good Thai restaurant in Amarillo. As we pulled up, I saw a Historic Route 66 sign. Once again, I felt at home, even in a city with which I was completely unfamiliar. There really is something romantic about roads. A good road is greater than the sum of its parts. Roads like the Via Appia, Watling Street and the Pacific Coast Highway hold a special place in my heart. But all of them pale in comparison to Route 66, the Great Mother Road.